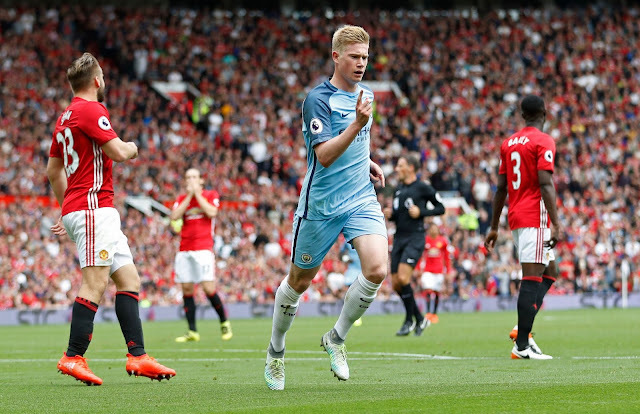 Pep Guardiola came out on top in the Manchester derby at Old Trafford as he renewed hostilities with managerial nemesis Jose Mourinho. City threatened to humiliate United in a dominant first-half display, racing to a 2-0 lead through goals from Kevin De Bruyne and Kelechi Iheanacho. But a mistake by City keeper Claudio Bravo, making his debut following his move from Barcelona, allowed Zlatan Ibrahimovic to pull a goal back for United. Mourinho threw on young striker Marcus Rashford after the break, and the 18-year-old had the ball in the net, but the goal was disallowed after coming off Ibrahimovic, who was offside. Bravo, brought in to replace England keeper Joe Hart, endured a jittery debut and was lucky not to concede a penalty and be sent off for a reckless lunge on Wayne Rooney after the Chilean had lost control of the ball inside his own area. De Bruyne nearly made it 3-1 to City when he burst through on goal in the second-half, but his shot cannoned off the inside of David De Gea’s near post and scurried across the goal-line to safety.